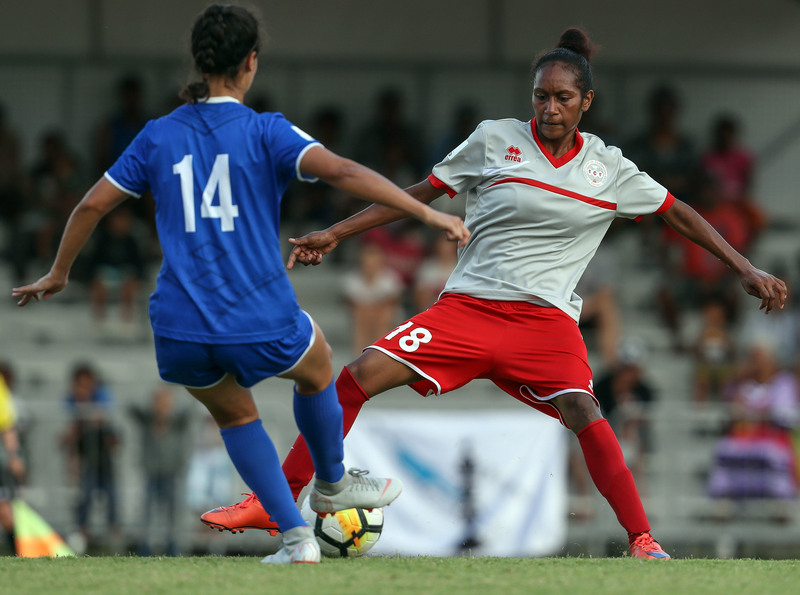 New Caledonia held off a spirited Samoa to win 2-0 and go through to their first OFC Women’s Nations Cup semi-final, joining the group leaders Papua New Guinea who came from behind against Tahiti, going on to win 3-1. New Caledonia coach Kamali Fitialeata was delighted his side came through with a win to put them in good stead ahead of the semi-final. “We’re in the semi-finals yes, but I think today what made me happiest is that the players showed today what they are capable of,” he said. New Caledonia didn’t get off the mark quite as quickly as they might have hoped with Samoa proving strong tactically, setting up a deep block with pace up front for the counter attack. In addition, Samoa seemed to be able to stifle the normally lethal attacks of Jackie Pahoa, with Matalena Daniells sticking tightly to the 16-year-old which kept her in check. The return of Josiane Ayawa added strength to the left, while the injury to Aurelie Lalie provided an opportunity for Marilyse Lolo and Kamene Xowie to show their dominance in the midfield. Samoa’s plan of attack was fairly straight-forward with a solid backline, some man-marking of the particularly problematic opponents and an aim to try and use the speed of Sina Sataraka to try and penetrate into the final third. It’s a plan of attack which seemed to work reasonably well as Samoa made several decent attacks however the hosts were by far the more dominant side across the course of the encounter with poor finishing proving their weakness. It wasn’t until the second half that Samoa’s defences really started to breakdown and it was young striker Ami-Nata Ajapuhnya, making her first senior start, who found the back of the net when she connected with a cross from Kamene Xowie heading it past Ronisa Lipi. It was then Xowie getting on the board herself in the 66thminute with a wonderful long-range effort which floated over a back peddling Lipi to extend the hosts’ lead. Team captain Celine Xolawawa made her first appearance in the 74thminute, replacing Ajapuhnya, making an immediate impact starting an attack in New Caledonia’s final third before making the run upfield to finish a through-ball from fellow substitute Kim Maguire only to have Lipi arrive and spoil the party. The hosts continued pressing in the hopes of adding a few more to the tally but in the end two was all they needed to ensure they would progress as Group A runners-up. Samoa coach Nicola Demaine was pleased with the manner in which the team once again stepped it up another notch. “They followed the tactic, they did their best, we kept New Caledonia at bay for a long time and created enough chances to even take the game it’s was just getting them in the back of the net which was a problem,” Demaine said. In the day’s opening match Tahiti hoped a positive result against the group leaders Papua New Guinea could help them keep their dream of continuing the journey alive. Papua New Guinea’s speed and agility proved the strength in the opening two matches however perhaps knowing they had already secured one of the two semi-final berths on offer had them feeling a little comfortable going into this encounter. From kick-off they appeared lethargic and a little slow off the mark and they paid for that poor start with Tahiti, who needed the victory much more than their opponent, scored in the fifth minute through Hanihei Taumaa. Adding to their woes was striker Meagen Gunemba having a rare off day where every chance went anywhere but on target. While Gunemba struggled, that left room for some of the other players to step up and that they did with Selina Unamba netting the equaliser in the 31stminute. Papua New Guinea continued to press forward, peppering the Tahiti goal with shots before finally getting another break when a free kick was awarded just outside the box. Ramona Padio stepped up to take and beautifully curled the ball around the wall and inside the upright to Papua New Guinea in the lead for the first time in the match. Padio was then brought down in the box a short time later which led referee Torika Delai to point to the spot. Padio stepped up and slotted to the left of Vahinerii Puraga but it had to be retaken after a player encroached in the area. Padio once again slotted past Puraga, this time to her right, to extend the lead. Papua New Guinea coach Peter Gunemba said the match revealed his side’s weaknesses which gives them something to work on ahead of the semi-final. “I’m happy with the girls for the fight, coming from behind to get the win,” he said. “When Tahiti scored I didn’t panic because I felt we would always be able to win. “They were caught by surprise, when Tahiti scored the first goal they were all confused in the first half especially. For Tahiti the result of the match was disappointing, but against a strong and experienced Papua New Guinea side the team were impressive in the eyes of coach Stephanie Spielmann. “We really wanted to start this match well because our first and second matches that’s what let us down. We didn’t want to concede early because we knew that would make things difficult down the track,” she said. Spielmann was of course disappointed to be exiting so early in the competition, but believes a lot of progress has been made for women’s football in Tahiti over the past week. “We came here to test ourselves and although we have some small regrets, there are none from this last match.